Fully submersible and absolutely waterproof! Advanced features and lifetime warranty! The HyrdaPro™ LED Underwater Light is fully submersible and absolutely waterproof (IP 68 rated). It features a low profile, solid brass construction, & integrated LED technology. Remarkably, you can dim this light with our handheld remote control. And, change the beam spread in the field using our optional optics. Fully submersible and absolutely waterproof, this light features a low profile, solid brass construction, & integrated LED technology. 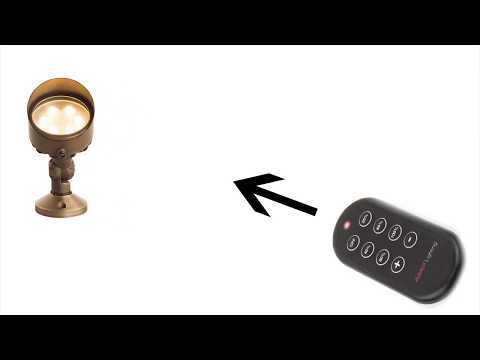 Remarkably, you can dim this light with our handheld remote control. And, change the beam spread in the field using our interchangeable optics. Integrated Cree® LED light source so you never need to change bulbs. Very high lumen output compared to "other" underwater fixtures - ensures bright underwater lighting. Optics are easily and quickly replaced to achieve up to 2 beam angles - for fast adjustment in the field. Comes with 60 degree installed and 35 degree in the box. Solid cast brass construction ensures these fixtures are made to last - backed by our lifetime warranty. Pressure-fit gaskets & our stainless steel wire gland keep this fixture waterproof. Extra heavy brass mount for stability underwater - with screw holes for other mounting options.